Let’s explore a pool chemistry concept that is not that well known, but highly effective in taking back the control of our pools. It’s simply based on a concept of meeting demand in a timely fashion – accomplished by using feeders with very large capacities to feed in a very short time. It’s called Hi-Capacity Feeding, and it’s re-defining how some of us in the industry are utilizing cutting edge chlorination as a 1st step approach in protecting the patrons of our pools. I am of course, assuming that the facilities filtration and ventilation systems are working properly. Excuse the following, as they are actually an exert from a discussion I wrote on HCF. When your pool is at it’s busiest, the feeders, (that the controller turns on and off), should have a large enough capacity to meet that demand in a timely fashion – without causing the resultant overshoot to be excessive when the pool is not busy. Sounds simple enough, and in itself, this premise makes sense to most of us. Many of us might even pose this question. Isn’t that what we are already doing? …Hmmm…maybe you should decide, and perhaps contemplate if that what we are really doing is truly getting the results we all need. Should we continue to do business as usual, or does it make sense for us to consider that it is time for change? This is what most of us are doing now. Be honest… How many of our controllers are on for hours playing catch up? Hey, it would be nice if they shut off sooner, but that’s just not practical. We are secure in our belief that our controllers are working just fine – our security blanket is in knowing they will be off in the morning when we get there, and that our PPM’s will be just where we want them. Most of us have come to realize this: Expecting anything more is wishful thinking. It just isn’t going to happen. What happens when the pool gets real busy, and our chlorine levels drop below code requirements? This should be easy for you, as it is a very common approach that we see time and again. Either on our own, or from a recommendation from our installers, or from the Health Dept, the recommendation is to simply maintain a higher level of chlorine. For most of us, our security blanket is to raise the set points higher in order to have an initial elevated level of chlorine in the pool in the morning, in hopes of it being enough of a buffer, or reserve, when the pool gets real busy. Unfortunately, everything has trade-offs, and the trade-off of this approach is a little bit more than the cost of using more chlorine. The real trade-off is something that most of us haven’t really heard before. There is a rule of chemistry that is based on the “Square of the Concentrations of the Reactants”. What it basically says is: “If we double the chlorine level, we stand to get four times the yield of chloramines”. That’s not good…is it? More chlorine = more chloramines…Interesting, huh? Is that the way we really want to run our pools? Are we dealing with the root cause of the problem…about why our controllers aren’t keeping up, about why the chlorine levels drop so low…or are we just putting a band-aid on the symptoms we see? Band-aids that simply cover up symptoms have their own set of consequences. It’s a trade-off, and you have to decide if it is an acceptable one for you and your facility. So, what if we take this a step further? What happens if we put a timeframe as to what “timely fashion” is to mean? Let’s revise the above premise to include this statement. Your feeders should be big enough to have the capacity to meet that demand in minutes of actual feed time. What happens now is that one’s past experiences ree-ally begins to overpower this statement’s ideology. For all practical purposes, our gut feeling tells us that feeding chlorine in this time frame would just be asking for trouble. For sure, the end result would always be the same…failure and frustration. The underlying reason for this is deeply embedded in our training. For most of us, we view feeder-sizing issues as an area that is considered to be a constant, and one that we have little or no control over. It falls in the realm of this rational – It simply is, what it is. This is one area, where it appears; we have all really learned our lessons well. Big Feeders = Massive Overshoots when the pool is not busy. Nonetheless, the reality of this rational doesn’t change the overall importance of having feeders with sufficient capacity to meet demand in what truly is a timely fashion. The real reality is that our patrons deserve more. Isn’t it our responsibility, particularly in this economy with budget restraints the way they are, to give your patrons the best bang for the buck? It’s a balancing act of safety vs cost. Every facility has to balance this equation out for themselves…right? Maybe now is the time to make a change that has some common sense behind it? Chlorination – Now, chlorination is most often considered as our first line of defense, and should handle most of these assaults through a process of oxidation and disinfection. This process is not immediate, as it is often a multi-step process that takes time to reach an endpoint. 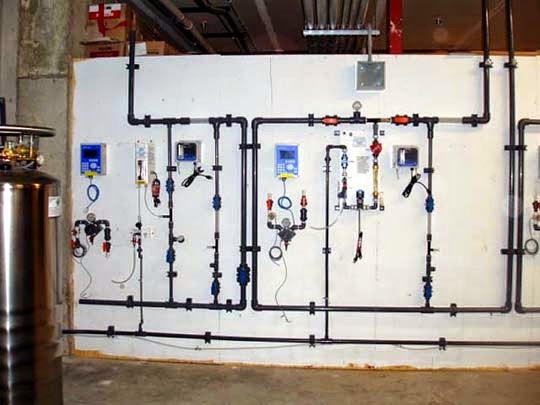 By its nature, this process will inevitably create certain chlorinated byproducts, the vast array of DBP’s, which takes even more chlorine and more time to eliminate. It’s these interim stages that wreak havoc on the many venues of both water and air quality. So, if you think the answer to this might be to just keep chlorine levels at higher concentrations, to insure that there is enough in the pool at all times, then you would be wrong. Remember, as the “Square of the Concentrations of the Reactants” has shown us that doubling the concentration of residual chlorine, poses the threat of creating 4 times the amount of byproducts. Increasing chlorine PPM’s isn’t the answer. Constant levels of High ORP – This approach is not well known, and sounds well on paper. It is an approach that many thought was a good idea theoretically, but again, not really achievable with relatively low levels of chlorine. Years ago, a noted Danish virologist, Dr Ebba Lund, showed us that redox potential, (also commonly known as ORP), can play a very effective role in the inactivation of Crypto. These studies by Dr Ebba Lund, showed that there is a strong linear indication that maintaining a continuous level of ORP above 800 mV, (irregardless of the actual chlorine PPM concentration), can inactivate Crypto in a fairly short period of time…a couple of hours rather than the long “ct” times based solely on PPM of chlorine and pH, as is now recommended by the CDC, and mandated for all of us to follow by many state codes. So with that said, let’s combine these 2 talking points of chlorination, specifically, using the “Square of the Concentrations of the Reactants” for the argument of keeping chlorine levels low, and tie them in with Dr Ebba Lund’s findings of cashing in on the benefits associated with the maintenance of a constant high ORP, and you tell me how this sounds to you. What would this mean for our pools…if? What if we were able to maintain relatively low levels of chlorine, maybe 1.5 to 2 PPM’s, with the capability of replacing it fast enough to keep up with demand? What if the result of doing this was the ability of maintaining relatively high levels of a constant ORP, lets say between 810 mV to 830 mV, that is maintained 24/7 throughout the pool via the set points of your controllers? In all due respect, irregardless of the CDC’s mandate of “ct times”, isn’t having the capability of continuously maintaining a fairly high ORP at low levels of chlorine, throughout the pool basin, a good security blanket in knowing that you have an added layer of protection for some of those incidents that we don’t know about? The point is, it’s all quite possible… simply by doing the basics well enough the 1st time around. Standard practice of eventually meeting demand is just not good enough anymore. So, why did I have this discussion? The point is this. We all have to deal with the various “alphabet soup” of chemical reactions and biological intrusions that occurs in our pools on a day-to-day basis. To do this effectively, we need a battle plan of sorts that offers multiple layers of protection. Meeting demand in a timely fashion, through Hi Capacity Feeding, is just the 1st layer. However, being the 1st layer, gives it the potential of being the most important layer if done right. It is a tool that can be very potent and very cost effective in terms of control measures. One technology isn’t going to do it all. Not just a new method of chlorination such as High Capacity feeding, not just some method of enhanced filtration that may get into the sub-micron range of capture, such as regenerative perlite filters, or even other technologies that get into floccing out some of the dissolved organics, and not just UV, whether that be low pressure or medium pressure. Did you notice the order? Meeting demand in a timely fashion through proper chlorination, maybe enhanced filtration into the sub-micron level, and only then and only then, if necessary, the utilization of the band-aid approach of UV, is the order that gives the most safety and best bang for anybodies buck. The inevitable truth for the vast majority of low to moderately used commercial pools is this. Do the basics well, and you might just be surprised in finding out that the band-aid approach may not even be needed. Don’t get me wrong. I am not against UV Technology. Some heavily used indoor pools and water parks may very well need the additional layer of protection that UV offers in chloramine and crypto control. It’s just that for most other pools, there are other more cost effective approaches that allow some of us some security in these times of budget restraints. Let's face it, the real reality is that not all budgets can afford the luxury of UV or ozone.